It’s been 7 years since my battle with postpartum depression first began. I consider myself a survivor now but living in the aftermath of postpartum depression is nothing like life was before it. I had hyperemesis gravidarum with all three of my pregnancies and it was horrific. But as soon as I pushed the baby out, the nausea went away instantly. Postpartum depression is not like that. With treatment, you will get better. The days will be brighter and the fits of sadness and rage will become fewer and far between. But it will always be there, deep down inside. It will be hard to forget the dark days and there will be reminders of them everywhere. You may go months, years even, living happily as a postpartum depression survivor and then suffer a relapse during a strenuous week of sleep regression or the flu. My personal postpartum depression treatment requires a consistent self-care routine and I’ve noticed that symptoms tend to rear their ugly head if I don’t keep up with it. I think of my postpartum depression like a wound. It happened and it healed but the scar remains. Most days I forget all about it but it is always there. We know that postpartum depression is NOT OUR FAULT. But accepting that fact is much harder to swallow. As moms, we put a lot of pressure on ourselves and we often feel guilty for something – our fault or not; we’re not spending enough time with our kids, we’re not giving them the best clothes, food, toys, education, etc. – you name it and a mom’s felt guilty for it. But the guilt that a postpartum depression survivor feels is much worse than your average mom guilt. The things we said or did while we were in the raw days of postpartum depression were not us. We couldn’t control them, we couldn’t anticipate them and we didn’t mean a word of it. But we remember all of it. And if there were witnesses around, (i.e. an older child or spouse) it’s likely they remember everything too. So no matter how many times we tell ourselves that it’s not our fault – we can’t help but feel guilty for all the things we said or did during the battle. Postpartum depression changes you. You can never go back to being the person you were before this. Your relationship with your spouse or significant other will either be stronger or broken entirely. They will also be a changed person because you can’t watch someone else go through something like postpartum depression and not feel anything about it afterwards. You could try this 30 Day Relationship Challenge from To The Altar & After! The same could be said of your friendships except it’s unlikely they even knew you had postpartum depression. If you alienated yourself from everyone while you were suffering but did not give an explanation why then you will probably need to do some damage control in the aftermath. Once you’ve doubted every single decision you’ve made, questioned your reason for living and hurt people you love – there is not much left that will scare you. You will reach a point where you think you just can’t handle it anymore – but then you do. You will recognize the all too familiar pain in other women and want to help them. Since you are stronger now, you don’t care who judges you for what. And while writing or talking about your experience will be hard and will likely stir up all the guilt you’ve been working so hard to abolish, the freedom you will gain from it is unlike any other. Sometime in the aftermath of postpartum depression, you will WANT to tell your story, whether it’s to your closest friends and family or complete strangers. I battled with postpartum depression silently for a long time and didn’t speak a word of it to anyone, nor did I have any intention to. The reason why I finally decided to share my story was because I was so emotionally moved by the tragic story of a woman from my hometown, Lisa Gibson, who suffered and died from postpartum depression in 2013 (along with her two children). The story, in itself, was truly heartbreaking but what bothered me the most was the public reaction. Many people seemed to believe that she got what she deserved. Her story was a worst case scenario, but I dreaded what others would think of me if they knew the dark thoughts and feelings that I battled with while I had postpartum depression. 1.) I was not alone. 2.) We need to annihilate the stigma of postpartum depression. As a survivor of postpartum depression, bringing awareness and help to others who are suffering is a cause that is close to my heart. While it can be terrifying to “speak up when you’re feeling down” it is so important both for our own mental health and to help bring awareness about this debilitating condition. *This post contains affiliate links which means that if you click on one of these links and buy a product, I may earn a small commission at no additional cost to you. Rest assured that I only recommend products that I love from companies that I trust. **Furthermore, I am not a medical professional and nothing in this post should be taken as medical advice. I am simply a mother who has been there and lived to tell the tale. Check it out – I’ve added to this list! This comprehensive guide to maternal mental health disorders from Parenting Pod offers plenty of information to help you understand your symptoms. Think you might have postpartum depression? Take this quiz from PostpartumDepression.org. Obviously we want what’s best for our child but it would be a mother’s worst nightmare to be deemed incapable of caring for her own child (the child who got her into this mess in the first place, might I add). If anyone knew the thoughts that a mother with postpartum depression has on a regular basis, they would lock her up and throw away the key. For some reason, society has led us to believe that having postpartum depression is our fault. Admitting to it is admitting that we were one of the weak ones who fell susceptible to the curse that is postpartum depression. We feel like terrible people for thinking and feeling the way we do, even though we have no control over it. If we are diagnosed with postpartum depression that means we are classified as “mentally ill” and will need to accept the stigma that comes along with that label. All of a sudden we are dangerous and unpredictable. Will other people start to question our parenting skills now? Will they treat us as if we are delicate and fragile and weak? What will our co-workers or employers think? Will having postpartum depression jeopardize our futures? This is not the way it was supposed to happen. In our dreams of becoming mothers we pictured it blissful and beautiful. We imagined sitting in a rocking chair, singing lullabies to a sleepy, happy baby. And when it wasn’t like this, we felt like we had failed. We failed our children and robbed them of a happy childhood. We failed our spouses and robbed them of a happy marriage. We failed ourselves and all of our dreams of motherhood. No one ever wants to admit that they are a failure. We think it will go away on it’s own, eventually. Or maybe we are planning to tell someone when it gets worse… it just hasn’t yet. We think that if we sleep a little more, relax a little more, meditate and do yoga that our postpartum depression will magically go away and so there’s no need to burden anyone else with our problems. Self-care while battling postpartum depression is extremely important but it’s highly unlikely that the symptoms will go away without a proper treatment plan. It’s a sad truth that many women who open up about postpartum depression still don’t get the help they need. Unless you already have a trusting relationship with a medical professional it can be difficult to find the right person to seek help from with such a personal matter. The fear is that we’ll be told we’re over-exaggerating, drug seekers or that it’s all in our head. Regardless of how difficult it is to find good help, it’s so necessary to seek treatment. Postpartum depression will NOT go away on it’s own, and even if the feelings do subside after a while, there is always chance of a relapse. We’ve joined online support groups. We read the posts and silently agree without so much as a “like.” The women write about how they’re exhausted and overwhelmed. They talk about how they can’t sleep at night, how they can’t eat or can’t stop eating and how they worry about everything all the time. And we can relate to that. But what those women don’t talk about is the bad thoughts they have. It’s incriminating and requires a *trigger warning* and what if no one else feels the same way? I’m here to tell you that I don’t care what bad thoughts you have, I don’t want nor need to know what they are because chances are, I’ve had them too. You don’t have to say them out loud. You can pretend like you didn’t even think them, so long as you know that you are not the only person who has thought them. You are not alone. To prove it to you, here is a list of postpartum depression stories from other brave mothers who have been through the worst of the worst and still managed to survive (myself included). If you’ve read this entire post and can relate to all 9 of these things, then it’s time to do something about it. Staying silent about postpartum depression helps no one. Start by downloading this FREE printable PDF workbook to help you collect your thoughts and come to terms with what you are feeling and how you want to say it. Then, write out your story. It doesn’t have to be pretty – in fact, it probably won’t be. But don’t hold back. Think about all of the real and raw things you wish someone else had been brave enough to tell you. Next, decide if you are ready to tell it. Do you want to tell someone close to you or would you prefer to anonymously release it into the world for other mothers with PPD to read? Either way is fine, as long as you’re not keeping it all inside. If a woman in your life has recently given birth then there’s a 1 in 5 chance they are struggling with postpartum depression. It might be your partner, daughter, sister or friend but no matter who they are to you, it’s normal to feel helpless seeing them in pain. It can be even more discouraging when you try to help them and they shut you out. But don’t be offended, mental illness is a tricky situation and displays in many different ways. From a mother who has battled it first hand, here are a few tips that might help you understand her better and be able to provide the right type of support. It’s very common for a mother to be in denial about their postpartum depression at first. Even if she does have her suspicions, it’s unlikely that she will admit it out loud. This is why it’s important to recognize the symptoms in someone else so that, even if she doesn’t want to talk about it, you can be there to support her. Postpartum Progress – The Symptoms of Postpartum Depression and Anxiety in Plain Mama English. There is a lot of stigma around postpartum depression and many people still don’t believe it’s a real disease. If she does open up to you about having postpartum depression – believe that her pain is real. She is not being overly dramatic. She is not “just tired.” Motherhood is overwhelming in general and it will be for a very long time but postpartum depression is different – it’s uncontrollable. Postpartum depression and anxiety cause a lot of undesirable side effects and symptoms that vary depending on the person. This can make a woman feel and act like a hypochondriac. Sleep deprivation can aggravate postpartum depression but postpartum depression can cause insomnia so it’s a lose-lose situation. Do whatever you can to help her rest. If she cannot sleep at night, then make sure she gets frequent, short naps in throughout the day. Invest in a new mattress to see if it makes a difference in her quality of sleep. Here’s an excellent one that you can try for an entire year. With a new baby, it’s natural and understandable to be sleep deprived. If you’re having a lot of difficulty getting baby to sleep, consider hiring a sleep training expert. But if baby is sleeping through the night and mom isn’t, then there’s definitely something wrong. It’s still important to make sure that she knows she isn’t alone – as long as she knows that debilitating pain from postpartum depression comes in all forms. It’s not her fault. But she will try to blame herself anyway. Trying to find a reason why this has happened can inadvertently put more guilt on her. Yes, she’s tired, yes, breastfeeding is hard, yes, labor was intense but those are not the reasons why she has postpartum depression. If labor and recovery were a breeze, baby was nursing fine and sleeping well she could STILL have it. Knowing that postpartum depression does not discriminate and there was nothing she could have done to avoid it will relieve some of her guilt. Encourage her to take part in the free genetic research study to help determine the root cause of postpartum depression. For some reason, having a mental illness is embarrassing. While it’s important to check in on her and ask her how she’s feeling, don’t put her on the spot or force her to open up about it if she’s not ready. And definitely don’t go advertising that she has postpartum depression without her permission. The last thing she wants is everyone at your office knowing about her postpartum depression and offering to help. She will be mortified if someone she barely knows confronts her about postpartum depression, no matter how good their intentions might be. It takes time to come to terms with postpartum depression for many reasons. The more public it is, the more guilt and pressure she will feel about disappointing others. The day will come when she will openly want to talk about it but it should be her who decides when that is. Postpartum depression has a way of making a new mother withdraw from society and it has nothing to do with how she feels about you. And don’t be offended if she doesn’t want to see you. She’s not trying to keep the baby all to herself. Going out or hosting visitors means putting on a smile and talking to people when all she wants to do is be alone. Even her inner circle can be extremely irritating. In addition to feeling socially withdrawn, many women with postpartum depression also suffer from social anxiety. She may feel incredibly uncomfortable in public, even in small groups of close friends. Allow her some time to avoid social interaction, and gradually work your way up to larger social gatherings. Appetite changes are a major symptom of postpartum depression. She will either not want to eat anything at all or not be able to stop eating. Having a fridge stocked with healthy ready-to-eat food will help her get the calories and nutrition she so desperately needs (especially if she’s breastfeeding) without all the added exhaustion of having to prepare it. Proper diet and nutrition plays a big role in managing her symptoms, so it’s important to make sure that she has access to healthy food. Do it while she’s napping so she can’t tell you to stop. Cleaning will be the last thing on her mind but looking around at piles of laundry, overflowing garbage bins or dishes in the sink will cause her more anxiety. It’s one thing to tell her not to worry about the cleaning, it’s another to make the clutter magically disappear. A clutter free environment will help her mind to feel clutter-free as well. If you notice that she starts to become obsessed about cleaning, she could be suffering from Postpartum Obsessive Compulsive Disorder. Check out Jordan’s story to see if it relates. If she’s breastfeeding, you may feel like there’s no point in getting up for night time feedings. But those dark, lonely hours can be the scariest times for a mother with postpartum depression. If for no other reason than to keep her company – get up with her. She may tell you that she’s OK and to go back to bed but at least get up and check on her – check if she needs anything, rub her feet or her back while she nurses. Breastfeeding in itself can cause a lot of stress on new mothers. If you see her struggling, let her know there are online lactation courses available, so she doesn’t need to do it alone. Don’t try to force her to talk to you about her feelings. It’s much easier to talk to strangers who understand and won’t judge her and who she may never see or talk to again. She can be completely honest and vulnerable without having to worry about hurting someone’s feelings or having them take things the wrong way. Whether it’s an online forum, support group or a therapist – she will be much more comfortable talking to someone who has been in her position before and/or who has experience to share. Consider signing her up for online therapy. Via online therapy, she has the ability to work at her own pace and can chat with a licensed therapist from the comfort of her own home. Not happy, dressed up, perfectly posed pictures but real pictures. Pictures of her nursing in her pajamas. Pictures of her holding or sleeping beside the baby. Pictures of her when she hasn’t showered in 3 days and has dried breast milk all over her shirt. Take pictures of her crying. Aim for honest pictures of her so that she can look back at them when she is better and remember this part of her life. You can even make a special photo album filled with pictures of her and baby as a keepsake because she may not remember all these days as clearly. Reassure her that you will never show them to anyone else or post them anywhere, they are only for her. Don’t try to rush her recovery. Helping her find the right path to recovery is important but don’t keep asking if she’s feeling better yet. If she has a good day, don’t assume she’s past the worst of it. She may go years without an episode, only to have it triggered by stress, sleep deprivation, illness or something else entirely. Many women will battle postpartum depression for years, if not forever, so if you’re in this with her – prepare to go the lengths for her. Know that there is no cure for mental illness, only treatment options to keep it under control. 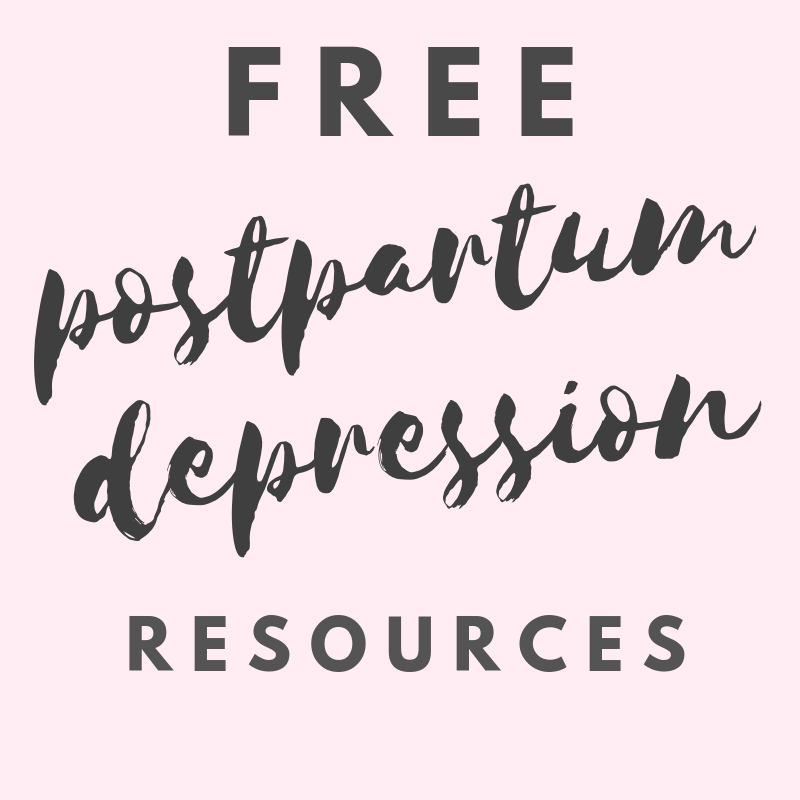 For more information on the recovery process, check out this post: How long does Postpartum Depression Last? Accelerate Your Recovery! Postpartum depression is one of the most under-diagnosed conditions in North America for a reason. Women, moms in particular, pride themselves in being able to handle it all and admitting that they are struggling or need help is one of the biggest hurdles to overcome. While these tips may help the woman in your life open up to you, nothing is ever for certain when it comes to postpartum depression and many women experience it in different ways. If all else fail – love her and support her and don’t ever give up on her. Get this FREE printable PDF Quick Reference Guide of National Crisis Support Numbers in the Running in Triangles Free Resource Library, available exclusively to subscribers of the Postpartum Depression Survival Guide. Click here to subscribe.